Teach Baseball Fielding and Throwing skills to your youth baseball players. If you coach your child's baseball team, this video will help you teach Baseball Fielding and Throwing skills to your youth baseball players. 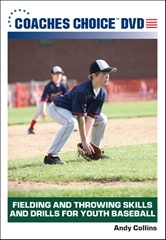 Fielding and Throwing Skills and Drills for Youth Baseball presents an overview of the basic fundamentals and techniques involved in fielding and throwing a baseball. The DVD also features a series of game-tested drills for improving each of these key fundamentals and techniques. Every drill is explained and demonstrated in an easy-to-understand manner. The DVD is designed to be the perfect resource for youth baseball coaches who want to improve the fielding and throwing skills of their players. To order your Fielding and Throwing Skills and Drills for Youth Baseball Video by credit card or electronic check, click this "BUY NOW" button. If you'd prefer softball to baseball fielding and throwing demonstrations I have a video where I take the girls through the same drills.